The essential idea in my abstraction is to extract visual elements inherent in the ‘detritus’ of everyday life and reorder their original presence. The juxtaposition of order and chaos, of the organic and the geometric, of clarity and ambiguity, and of diffusion and resolution form the genesis of my work. Our organic lives are ‘ordered’ out of the architectural geometry which surrounds us. That paradox is rampant with potential for visual construct, the arrangement of which supplies the optic content of my work. Since his arrival in New York City in 1972, by way of New Haven, Connecticut, where he earned an MFA in painting at Yale University, Gordon Moore has been steadfast in his commitment to abstraction. For over four decades, Moore has devoted his studio practice to developing a deeply personal visual language with which to explore, reconcile, and transcend oppositional realities. Moore’s images reference commonplace shapes and forms encountered during daily life in the chaotic, urban environs of New York City. Venetian blinds, architectural elements, a handmade palm leaf fan, and plastic spikes used to deter pigeons from roosting are among the many objects in which he finds visual inspiration. The work in this exhibition spans the years 2007 and 2017, a period during which the artist’s ongoing investigation into the material and visual potential of photographic paper has yielded significant and powerful results. 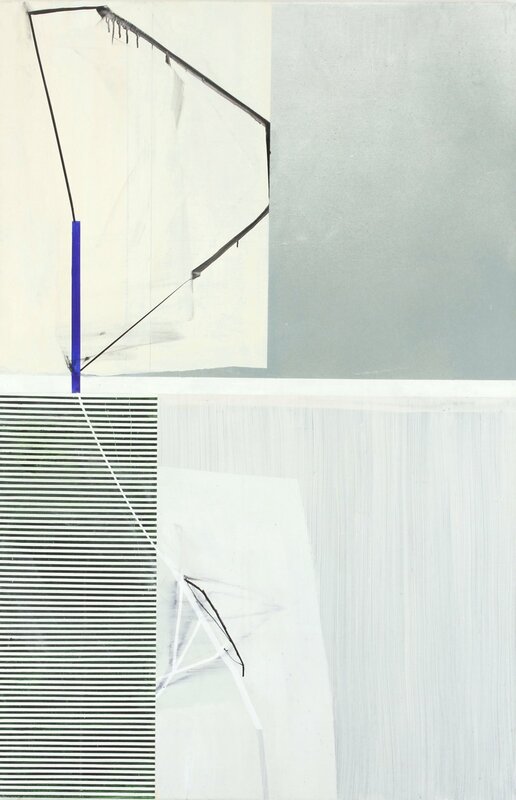 Moore’s paintings and drawings brim with a seductive uncanniness; there is a compelling and enigmatic ambiguity at work in the interplay among line, plane, and space. One is never certain about what one is seeing. Free of irony and pregnant with metaphoric potential, Moore’s imagery works toward a reconciliation of extremes — visually, materially, and otherwise. Untitled, 2016, acrylic, oil, and pumice on canvas, 65 x 42 in. Wednesday, September 19, 12-1 p.m. Bring a sack lunch, refreshments provided. Thursday, September 20, 6-8 p.m. Talk at 7 p.m.
October 13, November 10, December 8, 2 p.m.
All programming is free & open to the public!